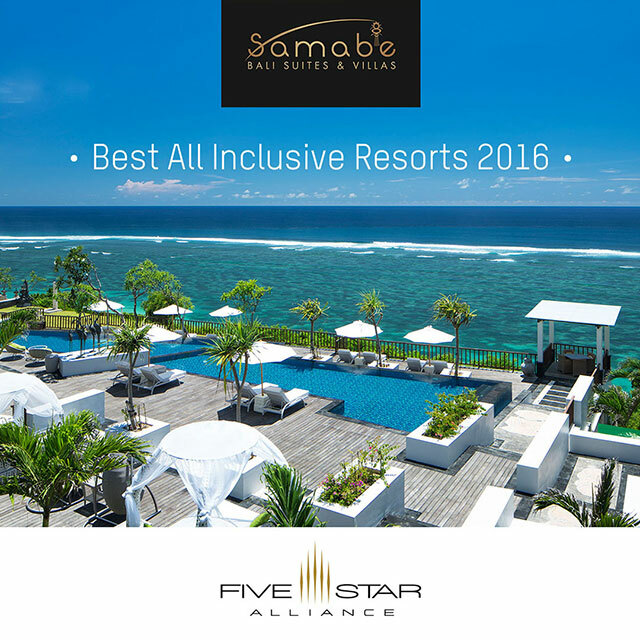 Nusa Dua, 5 May 2016-Samabe Bali Suites & Villas has been granted an award "Best All Inclusive Hotel" by Five Star Alliance earlier this May. The luxury all inclusive Bali resort has been selected among a thousand hotels in Indonesia to be aligned with other upscale hotels in the world. The Best Hotels Award aims to help the future travelers that prefer to stay in classy accommodation in choosing their hotels. The internal team of Five Star Alliance has handpicked 13 accommodations in the world as the Best All Inclusive Hotels 2016 based on the feedback from their loyal customers, the high-end travelers. "All Inclusive offers more than a standard hotel does. We have to be beyond the expectations of our upmarket consumers in each aspect that we deliver, from service to food and beverages. Serving great food and beverages but poor service and unsatisfactory rooms will not make us an excellent all inclusive resort. Therefore, we are glad that our hard work has been proved by this reward" explained Mr. Luthe as General Manager.